Are you feeling stuck? Are you having trouble reaching your goals, or even figuring out what your goals are? Do you struggle to make meaningful, lasting changes in your life? If you’re ready to get a fresh perspective and tap into the strengths you already possess, let me help you gain a fresh perspective on things. You are the expert on your own life and are filled with your own wisdom – sometimes you just need help accessing it. I am a licensed clinical professional counselor working out of Anchorage, Alaska and have spent some 18 years working with people who are struggling with a wide variety of problems, including depression, anxiety, post-traumatic stress disorder, personality disorders, and addictions. I especially enjoy working with faith – based clients, who tend to appreciate the fact that they don’t have to educate me about the daily realities of their lives. A non-judgmental and open-minded approach is taken with all clients, no matter the kind of problem they’re struggling with. Interventions are tailored to meet the needs of each client, but my overall approach tends to combine cognitive-behavioral and psychodynamic therapies, with a pinch of Adlerianism to tie it all together. • We may not be responsible for past events that have happened to us, but we are always responsible for figuring out how to cope with them. • Our perspectives of events (what we tell ourselves about ourselves) are often what cause us problems, not the events themselves. • Changing our thinking can change our behavior, and vice versa. • Sometimes our actions are driven by factors outside our consciousness, and exposing these dynamics can help us regain control. If my approach sounds like it might be able to help you improve your quality of life, I look forward to hearing from you! Kenneth was a wonderful counselor, he really took time to send messages back, always had a lot of positivity, and regularly checked up on me. I came to this site looking for someone to listen and while I had to go through a few matches I finally found someone who oerfectl balances between professionalism and friendliness. I was not able to continue counseling but I still highly recommend Kenneth and using betterhelp. Thank you for all your time! 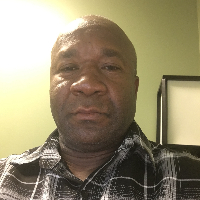 Would you like to write a review for Kenneth Brewington? We'd appreciate if you can spend a couple of minutes to write a short review for Kenneth Brewington (MA, CDCC). This review would be shared with Kenneth Brewington. It may also be posted in our website or in Kenneth Brewington's profile but it would be anonymous and your identity would be kept completely confidential.